I love that photo! They are really cute little guys (until your dog runs into them). We haven’t had that problem yet. Almost, but luckily Emma listened to “NO!” when she was only a puppy and came across one. It’s something I worry about though. That, and rattlesnakes. But your porcupine photo is really nice. Fortunately, none of my dogs have tangled with one. Fortunately also, there is a rattlesnake vaccine available for dogs. (I wonder, if it is available for dogs, why isn’t there one for humans too!) About a month ago I got an annual booster shot for Buster. Out west here, they don’t know a lot about it. Did your dog have much of a reaction when he got the vaccination the first time? No; no reaction at all to either of them, and I was not given any precautions from the Vet. Buster is big though (100lbs) and perhaps that makes a difference too. Yes, that might make a difference. Emma is very small, I’m guessing 20 pounds or a wee bit more. I’m a bit nervous to try her with the vaccine. The vets we’ve talked to in Montana have told us that once the dog has been bitten, the “vaccine” may or may not work, but it was around $1000 to give them the anti-snakebite serum. Actually, I don’t know if that is the same as the vaccine or if it is a special concoction to be used after the bite as a last resort. I just hope I never have to find out. I hope I don’t ever have to test the shots either. My Vet called it “rattlesnake vaccination” and it was $25 per shot. I recall that the first year there were two shots, a month or so apart, then just one this year. I would guess that, as with a person who has been bitten, the shots then would be very expensive. Let’s hope none of us have to find out the hard way. What a delightful photo. It looks like he is staring straight at you (hoping you’ll go away?). You were lucky to catch sight of him in that thick foliage. That’s exactly what he was doing. He seemed like a big clump of something in a tree that normally wouldn’t have a clump of anything in it. A closer look gave me a nice photo op. Probably thinks you can’t see him. I’m sure he hoped so, but he seemed to realize that I wasn’t a threat to him. Playing peek-a-boo with you, no doubt! 🙂 Such a cute photo! I still see them fairly regularly here but have few photos to prove it. Twenty years ago I would see them and their telltale signs very frequently, but not for many years now. I think, for reasons I can’t understand, they have nearly all been killed. What an awesome shot, love it. I think I’ve never seen one in the wild, maybe for the best. They are gentle creatures, although their defense capabilities are very dangerous to dogs who get too close to them out of typical curiosity. I like the picture, but those eyes haunt me, knowing how badly they have been treated. Very Nice! Love the eyes peeking out! This is one of my favorite wildlife photos ever. Everything about it’s perfect — just the right amount of leaves; the bright, inquiring eyes; the fact that you were able to get the body and spines in the photo, too. Is it my imagination, or is it lifting up one paw, as if to push the leaves away for a better look? it sure looks like those are two claws on the right side. You have very sharp eyes, Linda! Yes, those are claws but I don’t know if he had that paw up to get a better view or just to brace himself. That was one of my wife’s favorite pictures and I have a framed print on the wall. I haven’t seen a porcupine in many years, in fact this might be the last one that I’ve seen. They have all but disappeared in this area although they are still plentiful in other regions. The wildlife people have no definitive answer on why. They are still studying them to try to find out. The biggest problem seems to be in higher areas and there are practically no sighting of them above 4000 feet. He looks curious but shy! Do they climb trees? They are excellent climbers. Their diet is composed mostly of the cambium layer near the tops of young pines and firs (as well as needles) and when they were plentiful a sure sign of their presence was a bare section of a tree about ten feet from the top where one had stripped off all of the bark to get at that layer. When I was a kid and even into the 80’s that was a common sight when I was hunting or hiking around here. 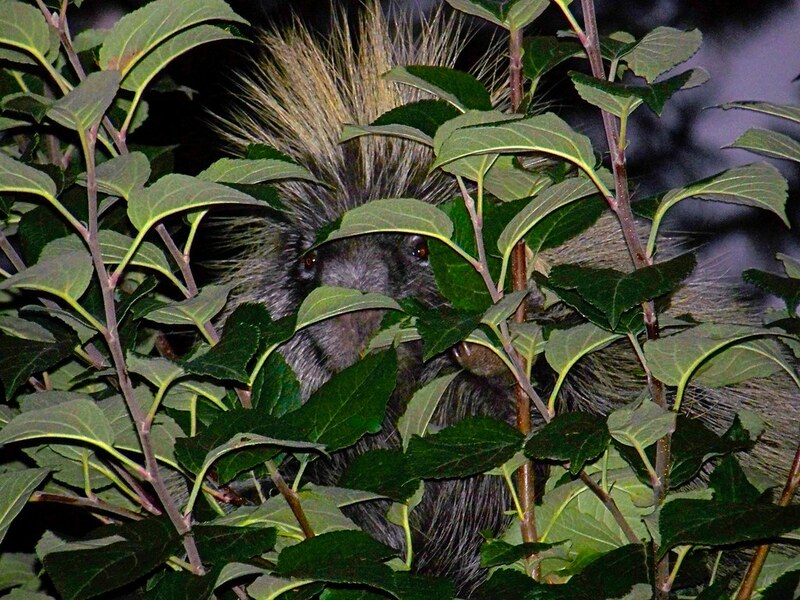 That is an awesome photo of a porcupine … he’s really watching you and “trying” to hide! He was, and yet he knew I was looking at him and he was wondering “what’s next?”. I wish I could think that everyone else that he saw was as kind and respectful to him as I was. Such gentle creatures have been sorely persecuted and deserve far better. That is a wonderful photo of it. I have never seen one in person. When I was growing up, they were plentiful, but now I seldom see one. I’ve read that the wildlife people are trying to figure out exactly why they have disappeared in this area, and especially over 4,000 feet. There is a long list of the possible reasons, but they haven’t found any one that’s conclusive. Porcupines are still doing well over most of their range, just not in this region. I hope someone will figure out why and perhaps it can be altered. Great photo! We’re still working on spotting one on a hike. I saw a couple behind our house near Bend growing up and one as a teen while deer hunting but haven’t had any luck since. I haven’t seen any lately either. When I was a kid I would see one or more and all kinds of signs that they were around. It’s really a shame that they aren’t still around. Excellent capture. My stupid question: Are they dangerous? We have only few in Finland and I have never seen them. They are very gentle and slow moving. Their quills are barbed though and can be a real hazard to anything that attacks them (like a dog). They are not aggressive at all and the quills are only a defense mechanism. Look at those beautiful little eyes. How did you see the porcupine hiding there? He was in an apple tree not too far from my house. I noticed some leaves moving on a day when there was no wind. I wish I could say that they are plentiful here, but they are not any more. I think this one understood that I was a friend.